In this case, a parallel gateway ensures simultaneous execution of two process paths: when the head of the department receives the task, the timer is set for four hours. When the time runs out, a script is executed and checks the status of the task. 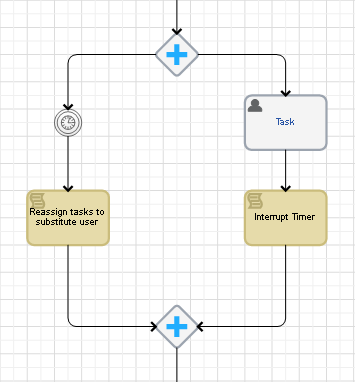 If the task hasn't been completed, the script reassigns it to the substitute user. If the head completes the task in time, the next steps of the process have to be executed, i.e. the timer has to be interrupted so that the process did not wait for four hours to check the task status. In this case, the escalation mechanism is used. To learn more, check this article "Process Escalation". 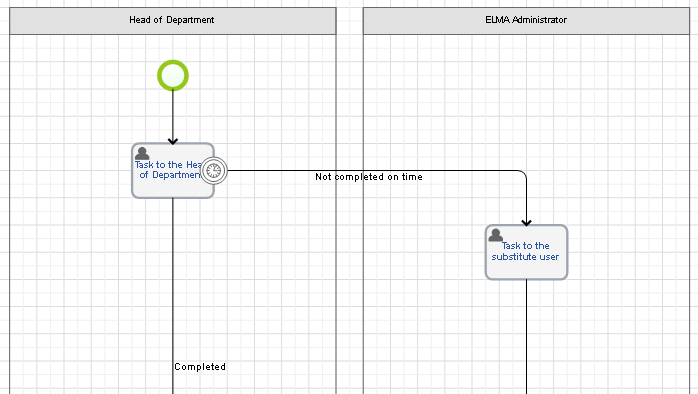 Here the timer escalation is used: if the head of the department does not complete the task in time, the business process automatically moves to the substitute user’s task, located in the respective swimlane.